This is another great Katha, which Somdej Toh received from an old scroll from Sri Lanka. The purpose of this Katha is to invite all great blessing and chants to the prayer. This Katha invites blessing from all the Buddhas and Arahants. Also it invites spells and teachers which old time people respect as Buddhamahaniyom (bless spell) to the prayer. It functions as aÂ mirror barrier called “Gum Pang Kaw Jed Chun” in Thai. It literally translates as the 7 glass of mirrors barriers, covering from the head of prayer to all around the body. No harm can get through. Wherever the person goes, he/she will be with good companies. That is why Phra Somdej amulets are most famous and expensive. Because it is believed that Somdej Toh blessed these amulets with Phra Katha Jinnabanchon. a.Â Protects from all harmful cause. c.Â Any place they go, they will gain the friendship of people they meet. d.Â It is believed that it can also make Holy Water to cure illnesses. e.Â Or any purpose their mind focuses to. Due to the fact it is a powerful Katha. It is the best advise for practitioners of this Katha to keep their precepts well. Many Luang Poh and Ajahns have advised as such especially the precept of sexual misconduct. No prostitution and sexual misconduct with wives of others. Misuse of this Katha will bring disastrous results upon the user! On a Thursday Day morning, prepare jossticks, flowers, candles and fruits. 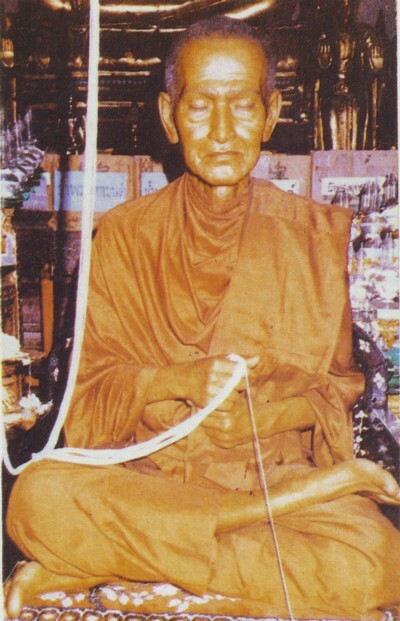 You either face the direction of Wat Rakang, Thailand or kneel before picture or statute of Somdej Toh. ‘Wai Kru’ or pay homage to our Teacher, Somdej Toh asking for his guidance and blessing to learn the Katha. (Anuraddha is in my heart , and Sariputta on my right.